I was amazed at the quality for the price. I have custom blinds that were so much more expensive than these but these are so similar. The cordless feature works very well even on my larger window. I can honestly recommend these blinds. the size selection was excellent. Let in a bit of ambient light with these cellular shades from Arlo Blinds. Made of woven polyester in a tube-like design that mimics the cells of honeycomb, these pure white cordless shades lend privacy to bedrooms and living rooms while allowing sunlight to filter through for a fresh, inviting atmosphere. Product Features: Energy efficient, softens incoming light, raise/lower with a clear tab on the bottom, inside or outside window mounting capability. Great product for the price. Easy to put up and operate. Measurements are very exact. I bought 33.5" width for 34" window and I have little 1/4" gap on each side so fits perfect. I did buy exact width for one window - two 35" blinds for 70" windows and they were too wide. But I just took off the plastic ends from the blinds (inside mount so you can't see it anyway) and cut small piece from the bottom slot and they fit exact and look fine. Easier they returning them. So you can modify them to 1/4 inch or so. These window treatments are a good substitute for blinds or roll shades when privacy is needed. I do not think they filter out as much light as blinds or shades. They raise and lower easily. I have not tried to clean them and do not know about the durability especially if children are present but there are no cords or wands to worry about. They are easy to install after you figure out how they clip into the mounting brackets. I live in NYC and have 3 windows that face the sun every morning. The windows are kinda old and very drafty, especially in the harsh winters. I've been debating for the past 5 years to get blinds for them to help keep out the cold air in the winter and hot sun in the summer but couldn't afford custom made. Finally I decided I've had enough and did a search of economical ways to shut out drafts and hot air. Honeycomb cellular shades came up. Overstock had them at the BEST price around. 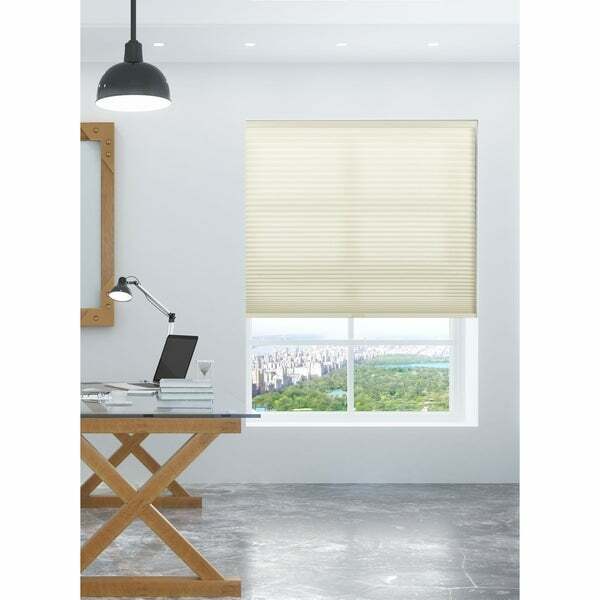 Delivery was very quick and the shades were very good quality for the price. I am clueless when it comes to any type of home repair type stuff and the instructions weren't helpful. But I youtube how to install cellular shades and after watching a few videos, was able to install them myself. I couldn't believe how quick and easy they were to install. I wish they came in 25" Width because the 25.5" that I bought for one window was just a few mm off so I have to return the one, but I LOVE the shades. They're so elegant and classic looking in the window. They also offer the kind of privacy that my curtains do not. I'm extremely happy with the blinds and highly recommend them. Great product but the coloring could be better.. This is an awesome shade and well worth the money. I purchased one shade to install in my bathroom. Installation was quick and easy. I have had the shade up for almost a year now, and it has held up perfectly. My only complaint is that the color is a little too yellow for my liking. When natural daylight is coming through the window, it looks cream/off-white, but at nighttime it definitely looks more yellow than cream (although it doesn't look that way in my photo-- maybe I am just crazy). Other than the coloring, I am very happy with this purchase! Shade is heavy duty and great! This blind/shade is better than described! The privacy aspect is good. I highly recommend this to anyone looking for a high quality cellular shade. 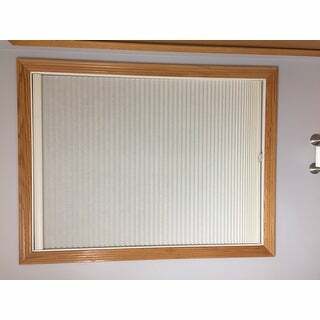 I have used the honeycomb cordless shades in our two bathrooms and like them so much, I decided to order for the guest room window. I like the clean sleek look of these shades plus the ease with which they go up and down. A great product! These blinds arrived in great condition and were easy to install. The installation system consists of brackets that mount to the window frame, or above the frame, and then the blinds simply clip into place. The color in the photographs is a good representation of the actual product. The room we were installing these in is yellow with ivory trim so the blind fit perfectly in the space. The cordless feature operates well and is convenient, as well as tidy. I love the blinds and am very happy with the purchase. If I need to change out any blinds in the future, I would definitely repurchase these. Great shades. They fit the window just right. They keep the heat in and the cold out. In the summer they keep the heat out and the cool in. 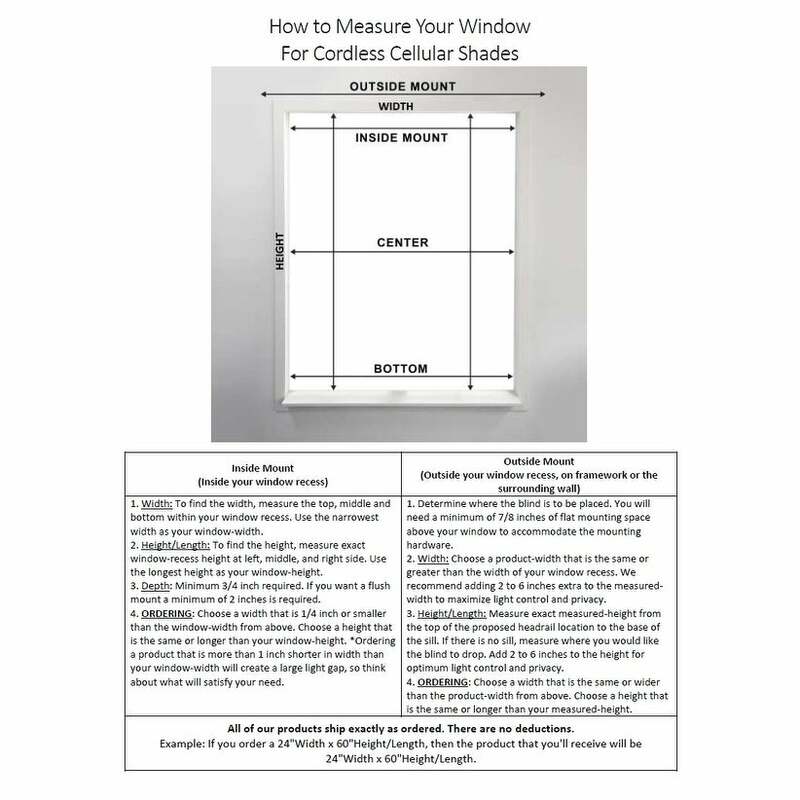 I would highly recommend these Light Filtering Cordless Cellular Shades. You cannot go wrong with these. Installed on the outside of the window on the kitchen door. It is nice to be able to completely close off that window which gets lots of light. They shipped quickly. When they are completely pulled up (no cords) I do not feel like anything is there! These light filtering blinds are as advertised. They are simple to install, cordless, and easy to pull up and down. the size fit perfectly. These cellular shades well worth the price. Bought a new home and put these in the master and guest bedrooms. Accented them with curtains and they look great. I recommend them. Did not realize the shade material was so similar to paper. It does not hold up well with the cats in our household. The price is too steep for paper blinds. While the diagram on the instructions was confusing, these blinds were not difficult to put up. The end caps on the bottom bar of the blinds falls off very easily. One of my blinds was opened at one end and the end cap was missing. When I called Overstock for a replacement part, they quickly sent an entire new blind with the request that I take remove the part I need and send it back. This is probably why my original blind was missing a part! This method of replacing parts is wasteful. Overstock should rethink this policy. However, the blinds look and work great! Love these shades. They measure width wise exactly, but length could be a little longer. Love these shades - look great and easy to install! Ordering more!! I love these shades so much I have used them all around my house. Great quality and easy to install. No need to pay a fortune for custom. These look like custom! Right on to measurements I gave! These are great! Purchased on a really good sale and saved a ton of money versus going to the local Home Depot. Next time I went to a friends house I noticed they had (what looked like) the exact same blinds but paid a fortune for them. they glide up and down easily. I just made an additional purchase of two more for another room! Great buy. Easy and classic. Exactly what I was looking for. Will recommend and. It again. very well packaged and arrived quickly. the shades are exactly as described and look great. "I have a bay window so can the shade brackets be placed up top?" Yes, they can be top mounted. "The blinds I want to order are for French doors, they are 27" x 69", what size do I order?" "We bought these a while ago and are just now finally putting them up. What is the hardware included for mounting? Ours doesn't seem to have any. There are the 2 plastic end pieces that slip off, that I considered screwing to the wall, but it didn't seem like that would be all you need. Thank you!" The customer who replied above is incurrate. The blinds can be pulled down and drawn up again and stays in whichever height position you so desire. To simply put it, you can go up and down as you please. Hope this helps! We love ours, they are great to find behind curtains or to close and hide from strangers on the outside. "Can the cordless honeycomb blinds be raised up if you want to have more sunlight ?" You can raise them to all the way up. When up all the way they are about 4 inches in length. These blinds can be raised to let in sunlight. "I need 60 inches in width and 40 inches in length for a kitchen window but you don't have this measurement. I also have to roll the shade over the window because there is no space from within to stick it in and roll it. Is this possible?" Yes. I would choose a width & length that cover the window & frame. Since you will be mounting over full window, this will look better. Then, you may have to add a strip of wood above the window frame to mount the shade on to bring the shade out so that it can be drawn down over the frame. I have done this. Is easy and looks nice. "Can I top mount these blinds so I can hang two side by side in a large window?"